Why zucchini? 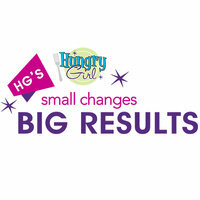 Here's the skinny... A single cup of regular prepared pasta has around 200 calories and 40 grams of carbs (SmartPoints® value 5*). That's a lot for such a measly portion size. 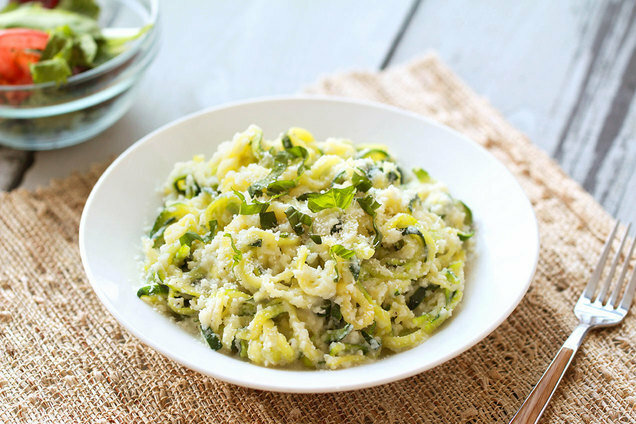 With cooked zucchini noodles, on the other hand, you can have TWO cups for about 70 calories and 14 grams of carbs (SmartPoints® value 0*). The zucchini also has about 4 grams of filling fiber. SOLD. What you'll need: We highly recommend picking up a spiral vegetable slicer, like the Veggetti. You can get one for 10 to 15 bucks on Amazon or at a store like Bed Bath & Beyond. It's super simple to use and a great investment. After all, we're talking pasta made from veggies, people! You can also use a standard veggie peeler, but a spiralizer will give you the quickest and best results. How to make 'em: Using a spiral vegetable slicer, cut whole zucchini into spaghetti-like noodles. 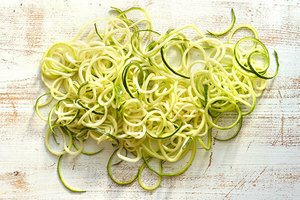 (If you don't have a spiralizer, peel zucchini into super-thin strips, rotating the zucchini after each strip.) Roughly chop for shorter noodles. Next, spray a skillet with nonstick spray; then cook and stir the zucchini noodles until hot and slightly softened, about 3 minutes. If needed, drain to remove excess liquid. Easy peasy! Place cauliflower in a large microwave-safe bowl. Add 1/4 cup water. Cover and microwave for 5 minutes, or until soft. Drain excess liquid. In a blender or food processor, combine cooked cauliflower, 1/4 cup Parm, garlic, salt, and pepper. Add milk and 3 tbsp. warm water. Blend on high speed until smooth and uniform. Combine drained noodles and sauce in a large bowl and mix well. Reheat, if needed. Top each serving with 1/2 tbsp. of remaining Parm. You like your friends, right? Then don't hold back! Share this zucchini-noodle info and Alfredo swap by clicking "Send to a Friend" or sharing it on Facebook.